Similar to plyometric training. Speed is referd to distance covered divided by time. Agility refers to short bursts of movement that involve a change in direction, cadence, or speed. Quickness refers to the ability to react to stimulus and appropriately change the motion of the body. Enhances client’s ability to accelerate, decelerate, and dynamically stabilize their entire body during higher-velocity acceleration and deceleration movements. Speed – The ability to move the body in one intended direction as fast as possible. Stride Rate – The number of strides taken in a given amount of time(or distance). Stride Length – Distance covered in one stride, during running. Speed is a skill that can be learned through an integrated training program. Proper running mechanics allows client to maximize force generation through bio mechanical efficiency. 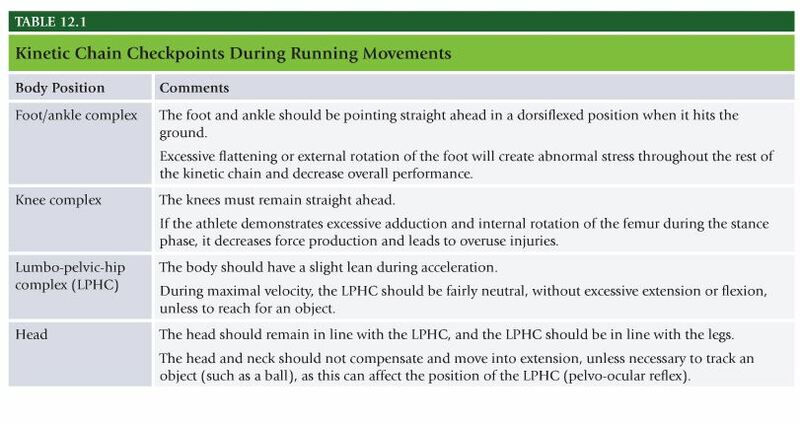 Frontside mechanics – Proper alignment of lead leg and pelvis during sprinting, which includes ankle dorsiflexion, knee flexion, hip flexion, and neutral pelvis. Involves triple flexion of the ankle, knee, and hip in appropriate synchrony. Improved frontside mechanics is associated with better stability, less braking forces, and increased forward driving forces. Backside mechanics – Proper alignment of rear leg and pelvis during sprinting, which includes ankle plantarflexion, knee extension, hip extension, and neutral pelvis. Associated with stronger push phase, including hip-knee extension, gluteal contraction, and backside arm drive. Agility – Ability to accelerate, decelerate, stabilize, and change direction quickly while maintaining proper posture. Requires high levels of neuromuscular efficiency to be able to maintain one’s center of gravity over base of support while changing directions at various speeds. Proper agility training can help prevent injury by enhancing body’s ability to effectively control eccentric forces in all planes of motion as well as by improving structural integrity of connective tissue. Quickness – The ability to react and change body composition with maximal rate of force production, in all planes of motion and from all body positions, during functional activities. Involves ability to assess visual, auditory, or kinesthetic stimuli and to provide the appropriate physical response as fast as possible(such as hitting a baseball or swerving to avoid car accident). Widely used and accepted way to improve sports performance in athletes, components of SAQ program also significantly improve physical health profile of apparently healthy sedentary adults and those with medical or health limitations. Increased neuromuscular, biomechanical, and physiological demand for such training can aid in weight loss, coordination, movement proficiency, and injury prevention when applied safely and effectively as seen in OPT model. Children are constantly growing, developing, and maturing until early adulthood. Children are programmed to develop progressively higher neuromuscular capabilities in line with their physical and mental maturation. Environment must challenge children’s biologic systems; must learn through external measures how to adapt and apply appropriate movement patterns. SAQ programs decrease likelihood of athletic injury, increase likelihood of exercise participation later in life, and improve physical fitness. Red light green light drills, follow the snake. Interval training is highly effective in improving variety of health-related factors. High intensity, short bouts of SAQ drills make them valid choice for interval training modalities with appropriate nonathletic populations. When designing SAQ programs for weight loss, primary focus is to keep heart rate appropriately elevated to increase fat oxidation and caloric expenditure. Primary function of SAQ for seniors is to prevent age-related decreases in bone density, coordinative ability, and muscular power. Aids in prevention of injury and increase in quality of life. Movement confidence and proficiency are essential in senior populations to aid in prevention of falls and maintain activities of daily life. Sarcopenia, age-related loss of skeletal muscle mass, slowing sarcopenai are interventions requiring speed of movement and rate of force production. Want to travel and have adventures for a living? In 2016 I spent 205 days hiking all 2,189 miles of the Appalachian Trail. I haven't had a "real job" since 2015. In 2018 I will be biking ~4,000 miles and hiking the CDT(2,800 miles). Anyone can create this kind of freedom in their lives. Follow Your Passions. Find Adventure. Live Frugally. Quit Your 9/5 Job. Follow my adventures by signing up to the e-mail list and learn how to live the life of your dreams.